In my latest Prairie Messenger column I explore the many family lessons one can learn from watching “Call the Midwife”. The series follows the work of midwives in the East end of London in the late 1950’s and the families that they serve. Based on the memoirs of Jennifer Worth, the stories are heart-warming and often uncomfortably realistic. This is, after all, what real family life is like. It can raise you to moments of great joy, or mire you in its messiness and challenges. Children are welcomed as a much desired gift, or as an unwanted addition to an already over-burdened family. Bishops from around the world are preparing for the upcoming Synod on the Family in October. Questionnaires were distributed (though not with equal success) in order to measure the pulse of family experiences and church teachings. One of the big questions, of course, revolves around the issue of birth control. 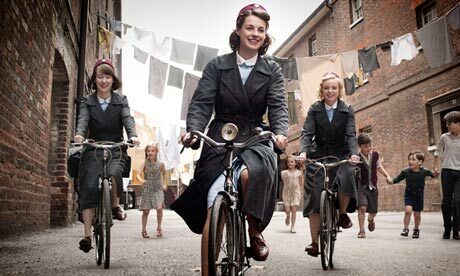 “Call the Midwife” takes place in the years before the dawn of the birth control pill. Humanae Vitae and it’s prohibition against any unnatural forms of family planning caused guilt-ridden grief to many women and men of my parent’s generation. Here was an answer to all their worries about unwanted pregnancies, only to be followed by threats of eternal damnation if couples chose to regulate births by artificial means. Today, even while most Catholics ignore the teachings of Humane Vitae, some bishops continue to make headlines fighting against easy or free access to birth control. This week, the Supreme Court in the Philippines approved a controversial birth control law which will give women free access to birth control. The law faced fierce opposition from the Catholic bishops in a country where 80% of the population is Catholic. In the USA, Catholic bishops denounced Obama’s healthcare plan because of its access to birth control. Do bishops really understand the reality of family life? Do they really understand the deep fear of an unwanted pregnancy? Are they truly being pro-life if they expect women to have baby after baby with no regard for the health or welfare of the mother or family? are papal canonizations a good idea? Great article in the Prairie Messenger Isabella! In the months ahead I hope and pray that the consultative process is deep and wide in order that this Synod on the Family may be primed by people who actually live day-to-day with the realities of family life. My worst fear is that the decisions and direction that come out of the Synod will be solely based on the wisdom of a 150 Synod Fathers – a group of Bishops whom have never experienced being a husband and a father. What of the experience and wisdom of mothers? Let us pray, as Pope Francis has urged, for the Synod itself, and even more importantly, for the consultation that takes place leading up to the synod. Let us also pray for the intercession of the Holy Family.